In second grade, I read 116 books to win the Bubble Gum Book Award for our classroom. My love affair with books has yet to simmer. While I fancy a good library, I am a sucker for buying books. I like to support the author. I savor the new book smell and feel. Most of all, I love to share my books with friends and family. It was my turn to host our monthly girl’s night. Over the years, I’ve noticed our discussions on our current reads. We are always bringing books to pass along to the next reader. Therefore, the decision to host a book swap was an easy one. To my elation, everyone was excited with the idea. Everyone was asked to bring up to five books they wouldn’t miss if they were gone from their bookshelf for awhile. When the girls arrived, they were given bookmarks for each book. 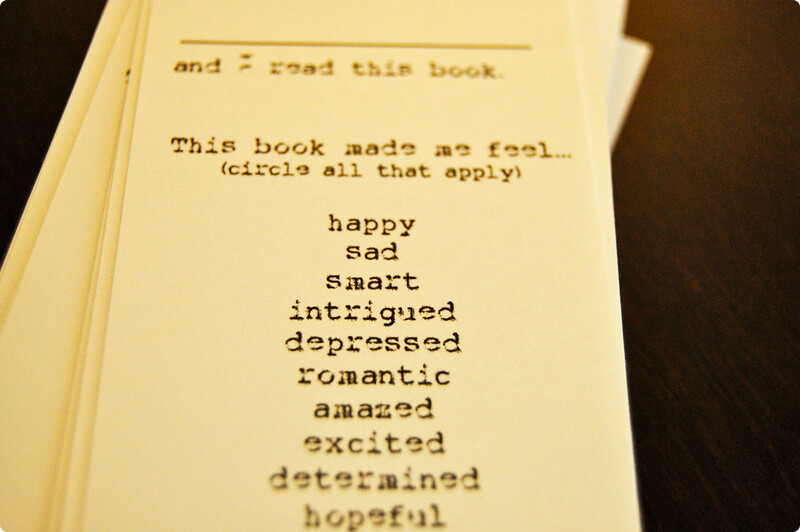 Everyone filled out the bookmarks, placed it in the book and set it on the table. You can download the printable version of the bookmark here. Each guest perused the books around the table. We asked questions, shared our stories and recommended books to those we thought would like it best. 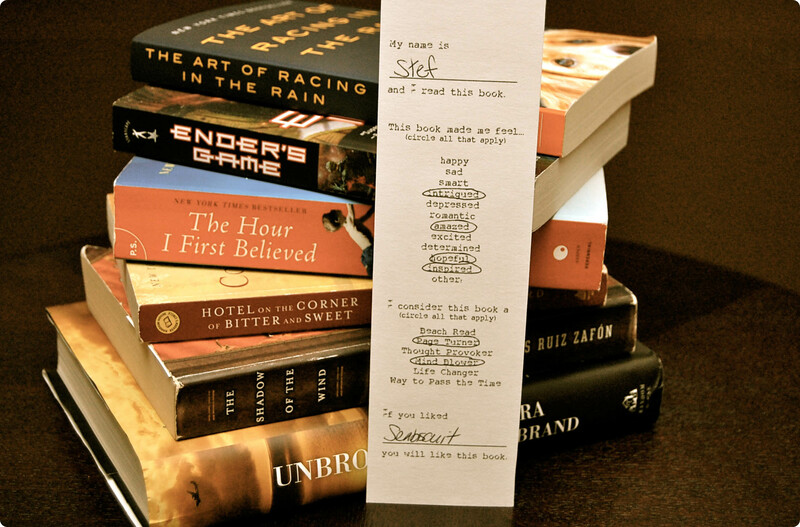 If more than one person wanted the book, names were written on the back of the bookmark so the reader knew who to pass the book along to next. Everyone left happy with a new handful of books! We didn’t find it necessary to pick in a certain order, since there were only about eight of us. If working with a larger group, I would suggest picking numbers out of a hat. Then have each guest pick one book each time around until everyone has reached their book quota. Pair some good books with a few delicious appetizers and a nice cocktail and you will have yourself a fantastic evening, especially if you are a book worm like me. This is a fun party activity with friends, or a good way to change up your monthly book club meeting. While we are on the subject of reading, I’d love to know what our HAP readers are reading! I recently finished Unbroken by Laura Hillenbrand and cannot stop thinking about it. It is an amazing and true World War II story of survival after survival after survival. I give it 4 full pies. What are your favorite recent reads? I’m reading Alice Waters & Chez Panisse, which is a really interesting biography. In fact, the sub-title says it all “The Romantic, Impractical, Often Eccentric, Ultimately Brilliant Making of a Food Revolution.” I think it’s a great read for anyone interested in the importance of the local farmer and sustainable ingredients. I seriously love this idea! I too am a fellow reading freak 🙂 Since I got a Kindle I now spend my money electronically and the one downfall of it is that I can’t share books. Some of my recent favorites include The Help, Hunger Games, Hotel on the Corner of Bitter & Sweet, Bossypants, and now I’m reading the Fever series by Karen Marie Moning…not the best, but good enough to keep me reading! @The Peach & The Pit: those are some of my recent favorites as well! I just finished Ann Patchett’s State of Wonder and I’m now reading The Homecoming of Sauel Lake by Jenny Wingfield. Im am on a young adult fiction kick (examples: Hunger Games, City of Ember) and I just finished The Alchemyst: The Secrets of the Immortal Nicholas Flamel by Michael Scott. Awesome! Cant wait to read the second in the series! @emily: I’m hooked on young adult fiction as well (and currently working on trying to write it as well!) Loved Hunger Games, I’ll have to try the others! Ender’s Game is my next YA read. I love this book swap party idea. I’m reading a few scifi books right now. But a couple of non-scifi ones I’ve read recently are “Enchantment” by Guy Kawasaki and “Hooked: Pirates, Poaching, and the Perfect Fish,” a real life story about Chilean sea bass fishing. What a great idea! I too was in a book competition during elementary school summers. My love of books has never waned. I have enjoyed most of the books in your stack, so maybe you will enjoy one that I just finished, The Invention of Wings. Based on two abolitionist sisters. I am trying to download the bookmark using the link provided but it isn’t working. If this link is no longer working would you be willing to email it to me? Thanks so much! It’s such a great idea, and I am hosting a book party this Fri.